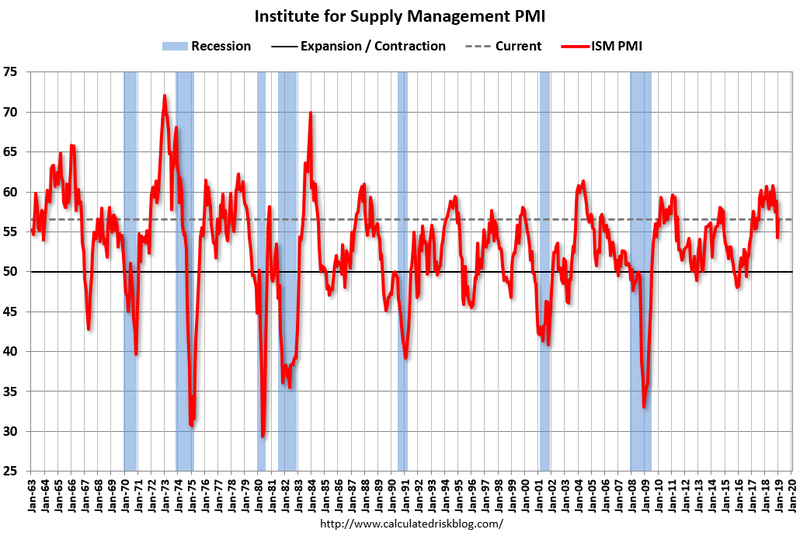 The January PMI® registered 56.6 percent, an increase of 2.3 percentage points from the December reading of 54.3 percent. The New Orders Index registered 58.2 percent, an increase of 6.9 percentage points from the December reading of 51.3 percent. The Production Index registered 60.5 percent, 6.4-percentage point increase compared to the December reading of 54.1 percent. 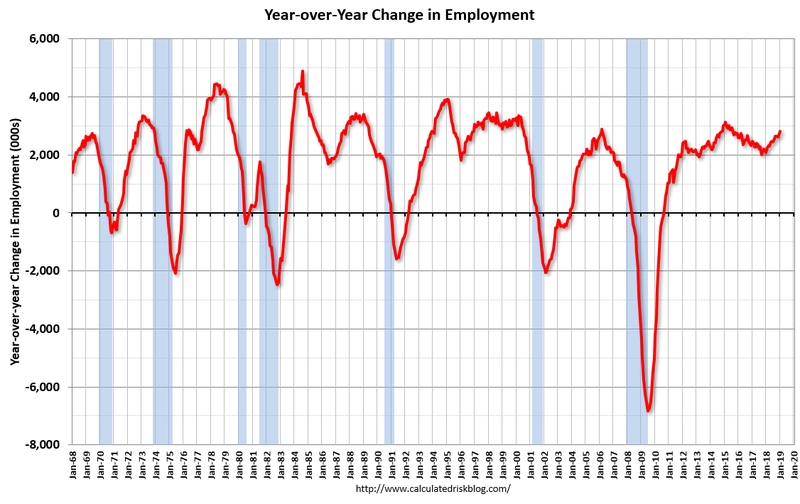 The Employment Index registered 55.5 percent, a decrease of 0.5 percentage point from the December reading of 56 percent. The Supplier Deliveries Index registered 56.2 percent, a 2.8 percentage point decrease from the December reading of 59 percent. The Inventories Index registered 52.8 percent, an increase of 1.6 percentage points from the December reading of 51.2 percent. The Prices Index registered 49.6 percent, a 5.3-percentage point decrease from the December reading of 54.9 percent, indicating lower raw materials prices for the first time in nearly three years. 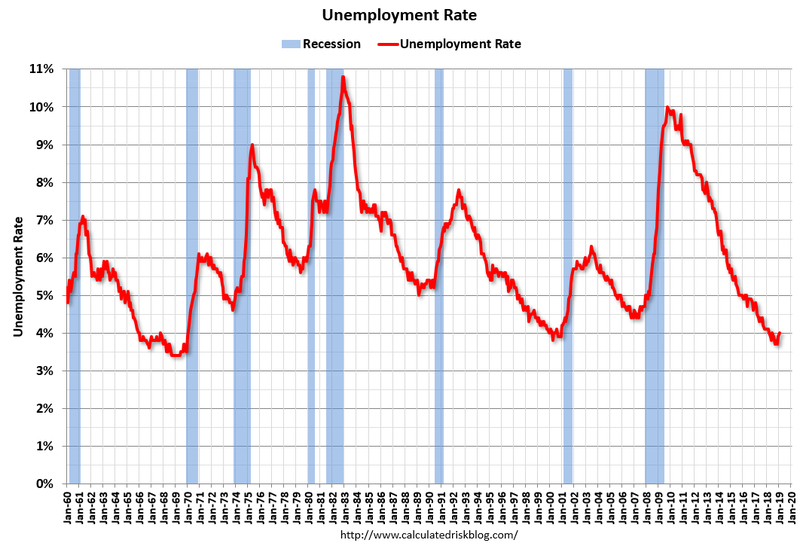 … Both the unemployment rate, at 4.0 percent, and the number of unemployed persons, at 6.5 million, edged up in January. The impact of the partial federal government shutdown contributed to the uptick in these measures. 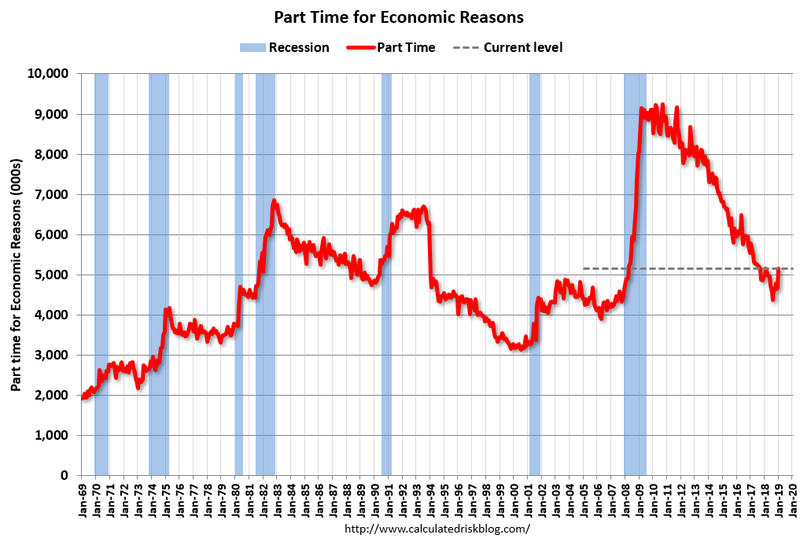 Among the unemployed, the number who reported being on temporary layoff increased by 175,000. This figure includes furloughed federal employees who were classified as unemployed on temporary layoff under the definitions used in the household survey. 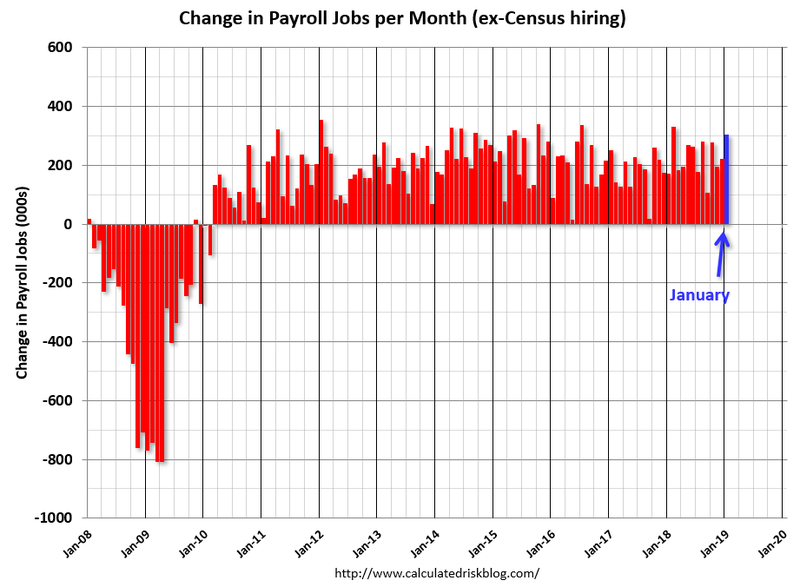 …The change in total nonfarm payroll employment for November was revised up from +176,000 to +196,000, and the change for December was revised down from +312,000 to +222,000. 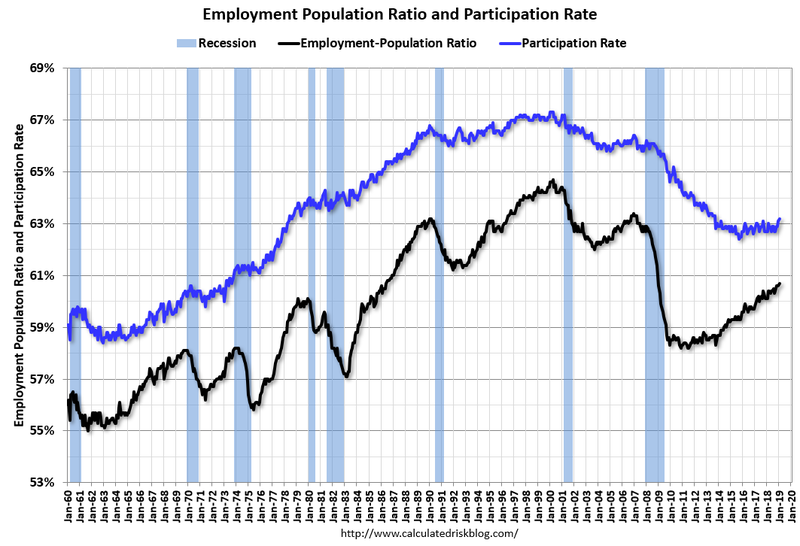 With these revisions, employment gains in November and December combined were 70,000 less than previously reported. …In January, average hourly earnings for all employees on private nonfarm payrolls rose by 3 cents to $27.56, following a 10-cent gain in December. 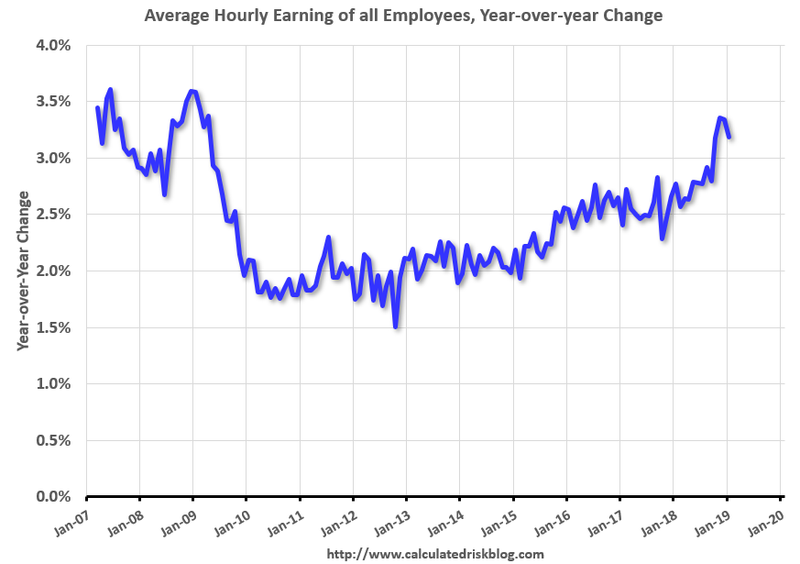 Over the year, average hourly earnings have increased by 85 cents, or 3.2 percent. This is not a market to take lightly this year. It is strong. Another month or two like that Fed hikes will return for mid-year. Is the ECB reaching the end of its rope by brushing aside weaker growth on ‘temporary factors’? After a whole year of hearing it, is it time to retire that narrative? If the central bank decides to revise its rate guidance in March, that’s when you know that they are no longer able to keep brushing aside the slowdown in the Eurozone economy as being ‘temporary’. The latest signs aren’t looking good as Italy is posting recession-like growth while Germany’s factory activity slumps into contraction territory. And when you see a hawk like Weidmann start turning against the narrative, it just feels like the central bank and lawmakers have to start accepting reality at this point. 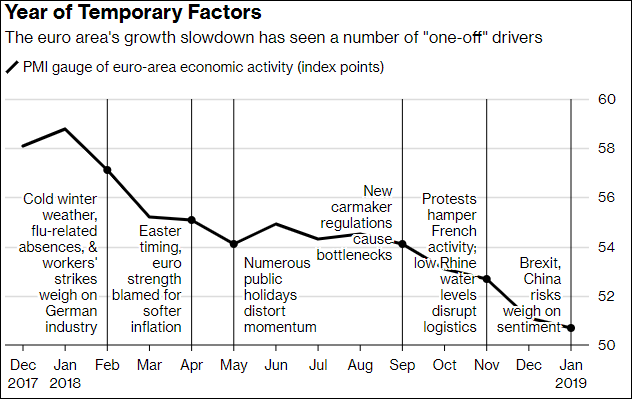 The ECB has continuously brushed aside the slowdown on “one-off factors”, but it is a narrative that is growing stale and markets aren’t buying it anymore. Inflation expectations in the Eurozone has fallen to two-year lows while rate hike expectations have been scaled back and in my view they are in no position to normalise policy at all this year. After Germany’s latest retail sales slump, which the German stats office is blaming on “a growing preference for gift vouchers”, it shows that policymakers and lawmakers aren’t ready to change their language just yet. 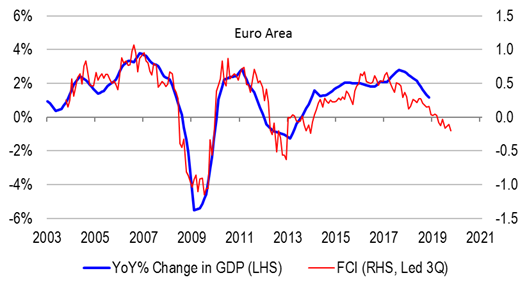 But the longer this drags on and the more that the trend continues to point towards a further slowdown, the ECB is surely running out of reasons already to keep avoiding the reality of the situation. The ECB will have to flip dovish. As we have been saying over and again, the US remains the growth leader and will all year despite slowing. The current move to EMs, commodities and risk assets like the Australian dollar is premature to say the least. David Llewellyn-Smith is Chief Strategist at the MB Fund and MB Super. The fund is positioned to benefit from a falling Australian dollar and rising bond values so he is definitely talking his book. Dow up 40% since Trump was elected. Alliances with North Asia & the Pacific now restored after the long dark era of Obama weakness & the failure of his Asian pivot. China is crumbling from within, its One Belt Road & One Belt Seaway plan totally corrupted & failing. First it was passive resistance and now it’s being actively undermined in the neighboring countries – rejecting China’s imperialism. The ‘One China’ policy has failed, no Taiwan unification, no ownership of the South China Sea. The US navy sails thru, China is mute. China’s little mad dog North Korea, China backed & fed as a nuclear threat – now neutered. China & Kim confronted & Kim crawling to beg a peace deal. China has become a pariah globally. 3 major rebellions within China. Their eastern seaboard cities seething with unrest, their western provinces virtually in martial law lockdown. And pending a US Tariffs on 25% of their exports. 19 million Chinese workers and up to 105 million Chinese dependents live off those exports – with US punitive tarriffs about to take effect after a temporary extension. China has no other market to dump that capacity into. North Asia, South East Asia, India et al – are all lined up to greedily exploit the situation to replace China as an ‘fairer trade’ exporter to the US. Donald Trump & the US holds all the cards. Will the despot Chinese communist regime ‘do the deal’ with Donald Trump in restoring the US China trade balance? Obviously. It will be blood on the streets in China and a communist party overthrow if they don’t. What does the US have to export that China needs ? Chinese imports in order of value. And where does China get those imports from today? IP/tech/ bio tech (mostly stolen) US, Europe. Services, North Asia, Europe, Australia. In any China US trade deal, Australian commodity & services exports to China are very exposed. US gas 19% cheaper than Australian or Qatar gas. US coal & ores cheaper than Australian equivalents. US food cheaper than Australian or NZ shipped. Australia has little IP or value add services apart from the Chinese migrant guestworker trafficking under the guise of foreign student’ or ‘tourist visitors’ working illegally – both of which are massive economic & social liability to Australia anyway. A Donald Trump US / China ‘trade balance’ deal will be at the expense of current exporters & trade providers to the China. And we will be one of those impacted. An Australia flooded with gas we can’t export. Coal & iron ore nobody now wants. And nearly one million* Chinese Hokou misfits & rejects dumped into Australia, expelled or fleeing China to be our social burden. *Chinese Mainland Communists in Australia. Almost all unskilled. Many are aged & a health and welfare burden. Most are Hukou ‘illegals’ – rejects who were expelled or assisted to Australia as part of the China 5 year plan Hukou Tier One Cities cleansing program. Many need to be repatriated back to China, with Australian border & visa controls put in place to stop any further import of these Chinese Hukou illegals under the guise of foreign student or tourist visitors. People really listen to the unhinged. It would actually be ‘unhinged’ to think nothing is going to change. Australia serenely carrying on exporting to China whilst under the US defence shield, and the China embargo / tariffs of US goods & China US trade imbalance blows out to half a trillion. The inevitability is China will buckle to import more US goods & restrict its IP theft & currency manipulation. Their US exports are over one fifth of all China’s exports & a quarter of its GDP growth. No other market to dump into. 22 million Workers & 120 million dependents. It’s blood on the streets if China doesnt fold & the US goes hard. And the US will, having very successfully demonised China & pulled together an anti China global alliance to apply full tarriffs, IP & other trade restrictions. Including telling Australia to toe the line. And what does China need to import? And what does the US have to export? As listed. Australia being one of the list. Also Donald Trump may just do a macro deal which has even bigger implications. Japan, South Korea,Taiwan aren’t going to continue to get a free ride in US protection (from China), without some quid pro quo in them also importing more from the US. And what exactly does Japan, Taiwan, South import and from who? It’s much the same list. Did you know US gas with the Chinese tarriff is 19% cheaper than Qatar or Australia gas. The US will overtake Australia then Qatar as the world’s major producer within 5 years. Who’s gas is swapped out? US Plant, Coal, Ores, base & refined metals, food, and even vehicles, all better, cheaper. Do China, Japan, South Korea, Taiwan have any particular loyalty to Australia in trade? They will align their imports to their major export market. And in Japan, Taiwan & South Korea’s case their protector. Which is not that the US imports less, but that China & North Asia import hundreds of billions more in US goods, and bulk gas & ore commodities…. Then who do you think would be displaced out of that? Mike – an excellent analysis! I couldn’t agree with all of that more….Thx! No doubt Germany’s Chancellor will in the years to come look back on these events and announce them as: “the gift-card giving inspired growth contraction we had to have”. Or, as it’s you know, Germany, “‎Geschenkkarte über alles time”.